Your customers love live chat. In a recent Zendesk Benchmark report, chat was revealed to be the channel that produced the highest level of customer satisfaction, beating even email and voice. On average, first reply time to a live chat request is 1 minute, 36 seconds; far quicker than the 22.6 hour average of all channels combined. So live chat’s popularity and effectiveness should come as no surprise. Further, the timeliness of chat gives it a distinct edge over email and social media support. Even when compared against another real-time channel, phone, live chat shines. Live chat allows agents to respond to multiple customers simultaneously, which makes chat a formidable ally in your quest to provide great service. 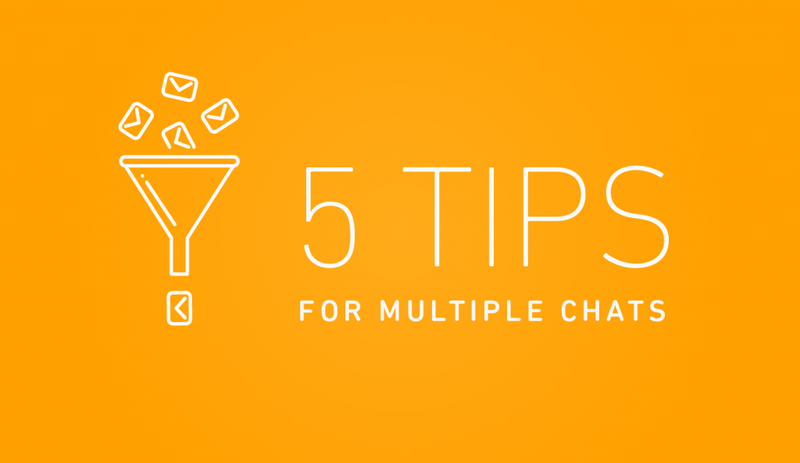 Here are five tips that will help your agents handle multiple chat requests without sacrificing quality. Good communication is vital and customers hate waiting. Respond the moment a new chat is added to your queue, introduce yourself, say hello, and get the conversation going. If you were already working on a previous chat, this will give you time to circle back to it. Good communication acts like a buffer between individual customers, giving you time to focus on each in turn. If you’re going to take a few minutes, either to do a deep dive on a customer issue or to work on another chat, let the customer know you’ll be a few moments and check in regularly. Never leave them hanging. If things get too hectic you can automate your response to let the customer know that you’ll be right back. We don’t always recommend doing this, but it’s helpful in a pinch. Always keep in mind that at the other end of your chat is a human being. So if you’re responding to three chats, you’re working with three distinct people. Nobody likes to feel like they’re speaking to a robot, so make an effort to listen and respond on an individual basis. Just because customer A is in a playful mood doesn’t mean customer B has time for a quick joke. This is probably a good time to discuss Shortcuts, an effective tool for providing quick, pre-written responses. When every second counts, it can be tempting to rely heavily on Shortcuts. But overusing them will make it difficult to provide support that feels human, so don’t overdo it. Different support teams will have different ways for dealing with the chat queue. Some will auto assign, some will create a rotation or shift system, and others may have an open queue that allows agents to choose when and how many chats to respond to. It’s important to measure the impact that the number of simultaneous chats an agent serves has on customer satisfaction. Try to find the sweetspot of the highest number of chats that will not interfere with customer satisfaction and stick to it. If four is all your agents can handle, you probably should ensure you have enough agents to manage the load. If one person has a lot on their plate, the other members of the team should help out and take on incoming chats. Of course, not all chats are created equal. One very difficult chat can take more time and energy than three easy ones. If an agent is working on something that requires all of his or her attention, that agent should let the rest of the team know so they can help pick up the slack. If a chat is so difficult it needs to be escalated, the agent should create a ticket in Zendesk and use notes to provide as much context as possible for whoever ends up working on it. The key is to always keep things moving. Solve chats you know you can solve, escalate the ones you can’t, and let your team know when you’ve hit capacity, so they can take open chats from the queue. When providing simultaneous support, staying organized is a must. So before you even get started, make sure you’re ready with a good desk setup that makes sense for you. For example, use two screens and multiple browser windows. On one screen, you can have all your open chats, each in an individual window. On the other, the live chat queue and commonly needed documentation articles, each in a separate window, so you can quickly provide relevant information and links to Help Center articles when needed. While this exact setup might not be ideal for you, it’s important to understand how you work best and organize yourself in a way that makes everything simple. It’s one less thing to worry about. When helping multiple people, each with their own issues, it’s important to be able to prioritize your queue. First and foremost, you want to give great support to every single customer. Keeping that in mind, you can then get to the business of prioritizing tasks. If you need something verified by the customer, ask for it right away. While they’re responding, move over to another customer. If you know a chat is going to be a particularly difficult one, get to it right away. Always know what needs to happen next. In fact, if you’re feeling overwhelmed, take 10 seconds and mentally prioritize your tasks. It might feel like a long time in the moment, but it will help you get back on track. Your customers will appreciate it and will likely have no idea that you just had a moment of panic. After all, it’s not like they can see you. This post originally ran on the Zopim blog. Please visit www.zopim.com if you’d like to learn more about Zopim Live Chat by Zendesk, a live chat software tool that is used by tens of thousands of customers worldwide.